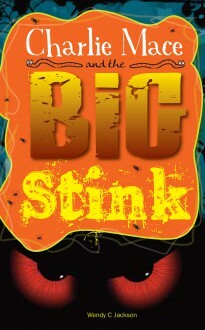 Charlie Mace and the Big Stink takes place on Sniff Street, which was the dirtiest, scruffiest street in Bogsley, and Miss Potts’ house was the most disgusting and revolting of all the disgusting and revolting houses in it. She seemed to take delight in surrounding the place with rubbish, bottles of rancid milk and maggot-infested garbage. And why did one of her eyes stick out like a glassy golf ball? No wonder eleven-year-old Charlie Mace did his best to keep away from the place. But one day Charlie finds himself cornered by Miss Potts, and is roughly transported into a strange woodland world, a world in which he encounters a very odd collection of beings. They all seem to live in dread of The Stink, a dark, smelly and noisome creature which haunts the forest. Charlie does his best to help his new friends fight back – and then he discovers the shocking link between the Stink and Miss Potts….